"With the hot Houston summer in full force, I wanted a cool treat that I'd feel good about giving my kids a couple times a day. I came up with this yummy alternative to ice pops and ice cream bars. The number of servings may vary depending on the size of your popsicle molds." Blend strawberries, yogurt, apple juice, and honey in a blender until smooth. 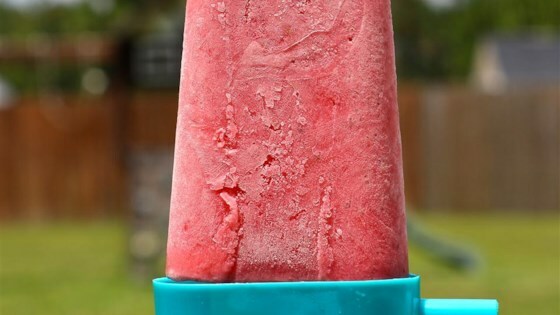 Pour blended mixture into ice pop molds; freeze until solid, about 12 hours. These were refreshing and very yummy! I used frozen strawberries because that is all I had and substituted Greek yogurt. I've tried this recipe and if u don't like honey I wouldn't make it becouse u can really taste the honey! I think it would taste alot better without the honey. Alot better! Very good yogurt bars which I really like (and it's my vote that counts :) The grandkids prefer popsicles not made with yogurt. I loved everything about this. I didn't find any one or another flavor too overwhelming and I really liked the silken texture. My not-quite-2-year old loved it as well! I blended strawberries, blueberries, raspberries, 2 whole carrots, a teaspoon of ground ginger, and a splash of lemon juice I used water as my base. Turned out great! The pops were fruity and creamy. They were better than those fruit pops you buy on the street carts. Big hit. Nice alternative to the sugary Popsicle. My 3 year old loves it.